Choose to paddle as part of a team or opt for a softer option and be rowed downstream by our professional guides in the safety raft. Enjoy a mouth-watering lunch mid-stream on the Nile and relax beneath the spacious thatched roof’s we have purposely designed and constructed at the start and end points of the rafting experience. There is no better value on the Nile. Starting just below the Bujagali Dam and entering the river at the renowned high flow ‘Jaws’ as our 1st rapid of the day, the Nile then beckons you further downstream. This section of the river is pristine, the trees and natural riverine environment creates a beautiful and fast flowing experience, before we prepare you for the first grade 5 rapids of the day. After a short paddle we then have 2 motivating rapids called ‘Pyramid’ and ‘Giggitty Giggitty’. Soon after these introductory rapids you will be ready to conquer the rest the mighty Nile has to offer! Our first Grade 5 rapid of the day is ‘Overtime’, which is a complex water fall, with an exciting drop depending on the water levels of the day. Shortly after this you enter ‘Retrospect’, a Grade 4 stopper wave with a roller coaster wave train following. With a calm section of the river ahead, your group has time to take in the scenery and wildlife on the Nile. A short paddle later and Bubugo is beckoning and is a Grade 4 rapid offering you another adrenalin pumping experience! 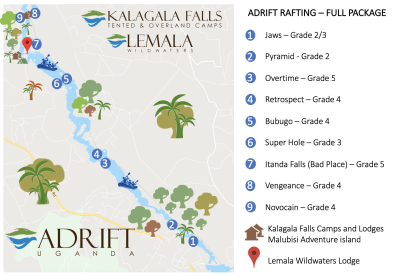 Just after Bubugo you have the opportunity to view our new developments at Itanda Falls, Kalagala Falls and Wildwaters Lodge, where we are developing the largest adventure camp on the Nile! Entering into Itanda Falls with our lodge, Wildwaters on the River left we disembark from the rafts to portage around the grade 6 rapids and falls, allowing for anyone to relieve themselves and to have the perfect #Instagram moment with this awesome rapid as the backdrop! With the rafts back in the water you will now enter the renowned and revered ‘Bad Place’ a Grade 5 rapid with more than its name to be impressed by. After the ‘Bad Place’ You will drift alongside the newly gazetted ‘Nile Central Forest Reserve; where the Government of Uganda and numerous private firms are working hard to revive the natural environment and habitat. Rafting with Adrift you get so much more safety, fun, enjoyment and service. Our last rapid of the day is ‘Vengenace’ and this is where we stop for a welcome BBQ and the opportunity for you to view the rapid from a unique position on our ‘Malubisi Adventure Island. The island is located between ‘Novocain’ and ‘Vengeance’ rapids and offers a range of facilities including a thatched rondavels, full bar, BBQ area and toilets.